Let’s see some examples of null. Now, let’s remove the first line from the above code and see the output. 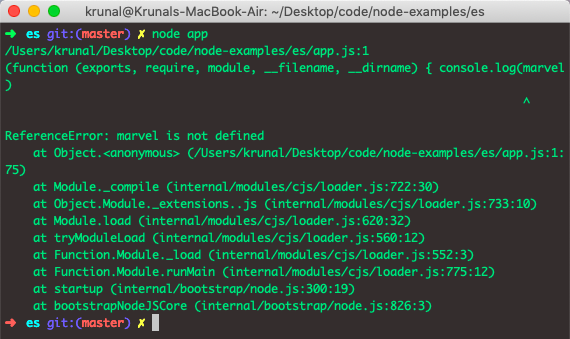 Now, run the file in the node environment and see the output. See, it throws an error. So when we assign the null value, it gives the null in return. Let’s check the typeof null. See the following code. Check out the basic math operations on null. Write the following code. The undefined is the property of a global object; i.e., it is the variable in the global scope. An initial value of undefined is the primitive value undefined. A variable that has not been assigned a value is of type undefined. The method or statement also returns undefined if the variable that is being evaluated does not have an assigned value. See the following example. In the above code, we have compared the undefined with the unassigned variable marvel. So, if the condition is true, it will print the console message. The output is following. The undefined and null are equal in value but different in type. See, if you compare the value, then they both are same, but if you compare its datatype, then they are different that is why we get false. Now, let’s check the typeof NaN. Run the file and see the output. So, the datatype of NaN is number. Not an object or undefined or null. If NaN compared to itself returns false, then no matter what we’re going to compare it to, it will always give false. See the following code.